THE ART OF CRASH LANDING by Melissa DeCarlo. I attended an event hosted by Harper Collins and I was so excited by this novel that I even tweeted about it! THE ART OF CRASH LANDING tells the story of Mattie Wallace. Mattie is a bit of a mess. She's pregnant and broke, and she seems to make one bad decision after another. When Mattie arrives on the doorstep of her ex step-father Captain Queeg, the one person in the world who really cares about her, she has hit rock bottom. All she has left is has a run-down car and her worldly possessions fit in six trash bags. Mattie can't help but she that she might be turning into her alcoholic mother. Mattie learns that her maternal grandmother (whom she's never met) has recently died, and Mattie's due an inheritance. She travels to the small town Gandy, Oklahoma, where she learns that her mother is a bit of a mystery. What caused her mother, who was once a well-adjusted teen, to leave town thirty five years ago without a trace? Mattie realizes that something terrible must have happened to her mom in Gandy that permanently damaged her and led to her premature death. Mattie decides to investigate her mother's past, but gathering information isn't easy. As Mattie begins to realize the truth about her mother, she also discovers some important things about herself. And this knowledge just might be what Mattie needs to save herself! I adored THE ART OF CRASH LANDING. This book had it all -- great writing, memorable characters, and a mystery. It was also both funny and touching. I devoured this novel and fell in love with the characters, especially Mattie and Captain Queeg. I honestly couldn't put this book down. I wanted to know the truth about Mattie's mom, but I also wanted to know if Mattie had what it took to survive. 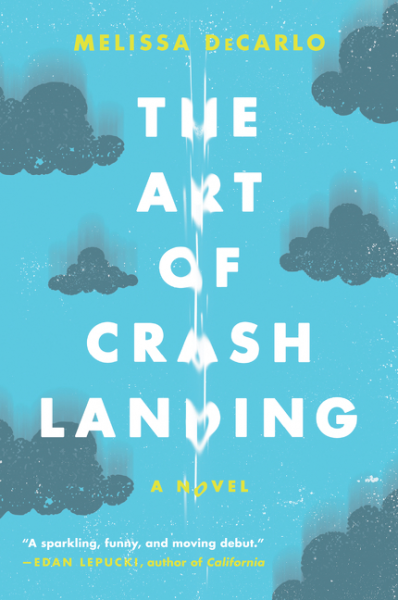 THE ART OF CRASH LANDING is Ms. DeCarlo's first novel, and it's quite a start to what I hope is a long career. Ms. DeCarlo wrote a fantastic story but she also told it in an impressive way. The novel is written in Mattie's voice and what a voice it is. Mattie is both crude and snarky (and even sometimes smart), but she also has a vulnerability about her. In fact often times I had to remind myself that Mattie was a grown woman and not a teenager. The pacing of the story was also good as it went back and forth between the present and Mattie's memories of her past. Mattie is just an amazing character -- one that is sure to stay in your heart and mind for a very long time. Mattie's insight into her life (and life in general) was hilarious but also very sad. I loved her determination to get to the bottom of her mom's past, and it was entertaining (albeit in a twisted way) to see how many mistakes Mattie could make. I also enjoyed how THE ART OF CRASH LANDING took me on an emotional roller coaster. At times, I was laughing out loud at Mattie, and then I'd feel like crying for what she was experiencing and learning about her mother. Another aspect of this novel that I liked was the exploration of mother/daughter dynamics. One of the major themes of THE ART OF CRASH LANDING was Mattie's discovery of her mother's past. Mattie realized that the alcoholic mother that she grew up with was vastly different from the girl who grew up in Gandy. Discovering the truth about her mom allowed Mattie to truly understand her and forgive her... and it allowed Mattie to accept and forgive herself. These events led Mattie to evaluate her own pregnancy and mothering skills. I would love to see lots of book clubs reading THE ART OF CRASH LANDING. It's truly perfect because it has complex characters and covers so much ground. There is a reading guide available with 14 thought-provoking questions. Some of the themes you might want to explore include mother/daughter dynamics, choices, the past, secrets, self image, trust, friendships, memories, guilt and forgiveness. I loved THE ART OF CRASH LANDING! Highly recommended to fans of women's fiction and fans of novels about dysfunctional families. Where was I? How did I miss this book? It sounds sooo good!